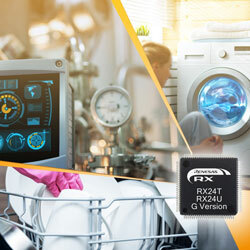 Renesas Electronics Corporation has expanded its RX24T and RX24U Groups of 32-bit MCUs to incorporate new high-temperature-tolerant models for motor-control applications that need an extended operating temperature range. The new RX24T G Version and RX24U G Version support operating temperatures ranging from −40C to +105C, while managing the high functionality, high speed, and energy efficiency of the RX24T and RX24U MCUs. Software can be produced using the RX24T and RX24U CPU cards coupled with the 24V Motor Control Evaluation Kit which allows developers to build motor control applications in less time.